My grandfather made the most amazing potato galettes. Unfortunately his recipe was never really written down and my mother and grandma both have only a vague idea of how he made them. I enjoy playing around with potato fritter recipes and like to think that he lends his watchful eye when I get in the kitchen and try them out. If you've been reading my posts this week you'll know that I have A LOT of apples to use! I grated a couple apples into these potato galettes and it really was delicious. The apple adds a nice and subtle sweetness to the starchy potatoes, and the crispy fritters dipped into a cold herby dip makes for the perfect snack. Grate the potatoes and apple into a small bowl. Place the mix into a kitchen towel and drain out the water. Transfer back to the bowl and fold in the flour, Parmesan and a good pinch of salt and pepper. Add the egg yolk and gently mix so all the ingredients are well incorporated. Add a good drizzle of vegetable oil to a non-stick pan or skillet. Once the oil is hot, drop a heaping tablespoon of the potato mixture and flatten to form a disc with the back of a spoon. Cook for 1-2 minutes or until the side in contact with the skillet is nice and golden brown. Flip the fritters and cook the other side for 1-2 minutes. Remove from the heat and place on paper towels to soak up excess oil. Whisk the sour cream and parsley in a small bowl. Add a pinch of salt and pepper and serve alongside the fritters. How gorgeous these fritters are! They look oh so yummy!!! I'm bookmarking these, lovely flavors! These look absolutely fabulous! I'm so curious how they taste with the apple in there. These look and sound yummy. I love potates..one of my favorite foods but never thought of combining them with apples. How ingenious! 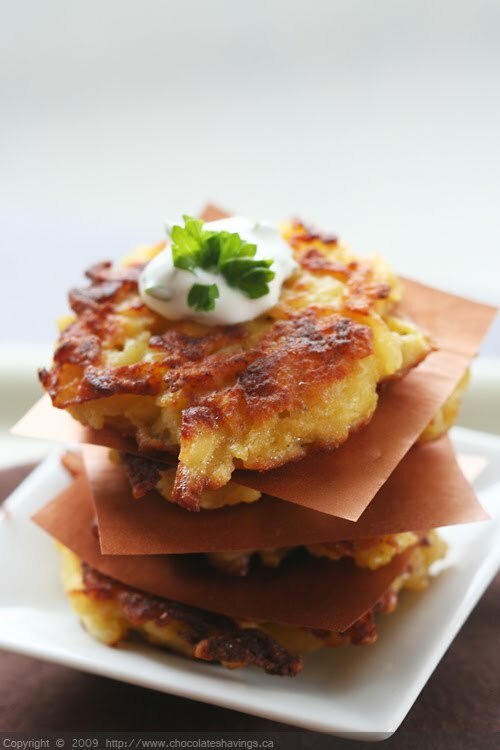 I love these, I make really yummy potato and onion cakes that would be even better with some grated apple added in. Looks fabulous! These are going straight into my "snacks" file ... can't wait to bite into these! So pretty! Loving your blog, your recipes, and definitely your pics! Oh my! That looks so very yummy! They sound delicious and look gorgeous, lovely photos! These look just wonderful! It's interesting, today I posted a blog about a recipe similar to a soup my grandmother made which I don't have a recipe for. Beautiful photography! So nice to find you! I gonna gives these a try. I love the idea of the apples in with the potatoes!!!! Oh man these look good. I love fritters, and dipping sauce is required! You have inspired me to cook some up this weekend, which I haven't done in way too long! These look sooo good! And I have all the ingredients to make them! Yum yum yum! Love the flavor combo of apple + potato. These look fantastic. Those fritters look amazing and I bet they taste even better. I like the sound of mixing apple into those savoury potato fritters. Love this combination! I never made an apple pie I was going to, so I may have to make these. I'm excited to try these myself. Thanks for the inspiration! Made these as an appetizer for Thanksgiving, served with apple-cranberry chutney. They were well received and I want some more right now ... thanks for the recipe! BTW I added a couple tablespoons of onion and an extra egg. Just FWIW. Anonymous: I'm so glad you liked them! Onions are definitely a good call for these! They're also very good with a couple tablespoons of grated aged cheddar cheese.